TALLAHASSEE – Gov. 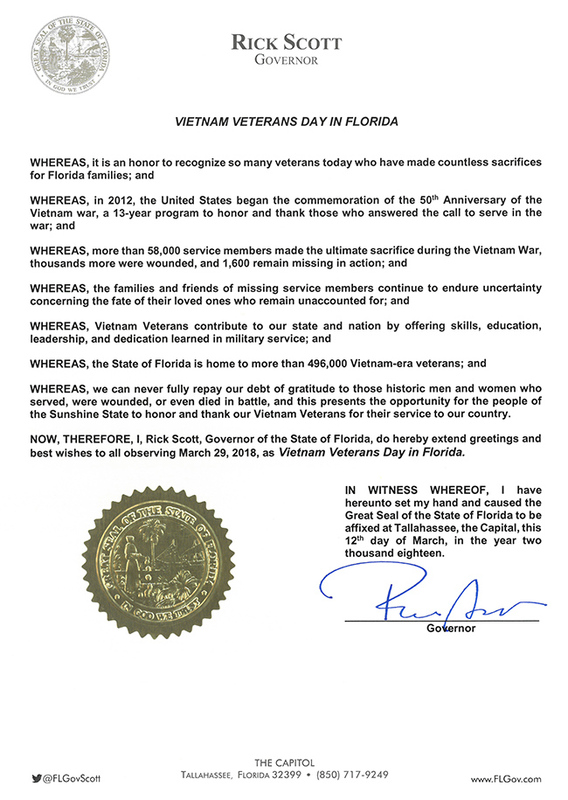 Rick Scott has signed a proclamation designating March 29, 2018 as Vietnam Veterans Day in Florida. The Sunshine State is home to nearly 500,000 Vietnam-era veterans, the state’s largest veteran demographic group. Vietnam Veterans Day is observed annually as part of the Vietnam War Veterans Recognition Act of 2017, signed into law by President Donald Trump last year. The act encourages Americans to display the U.S. flag each March 29 in honor of Vietnam veterans. In Florida, many VA Medical Centers, Outpatient Clinics and National Cemeteries are joining local communities by hosting events this year to honor Vietnam veterans. On March 20, Gov. Rick Scott presided over the groundbreaking ceremony of the 120-bed Ardie R. Copas State Veterans’ Nursing Home in Port St. Lucie. Florida’s newest veterans’ nursing home is named in honor of a Medal of Honor recipient from the Vietnam War — Fort Pierce and St. Lucie County native Sgt. Ardie R. Copas, who was killed in Cambodia in 1970.